Newly-appointed Head of the UN assistance mission in Somalia, Mr Michael Keating, made his first official visit to Somaliland on 13 March 2016. Somaliland’s Foreign Minister Dr. Saad Ali Shire received the delegation and addressed the country’s most pressing issue at the moment: a drought which threatens the livelihoods of up to 200,000 Somalilanders. Other topics discussed were political and development matters, as well as relations with neighbouring Somalia and possible UN-Somaliland cooperation. Foreign Minister Dr. Saad Ali Shire received a high level UN delegation led by Special Representative of the Secretary General Michael Keating to the Ministry of Foreign Affairs. In a meeting marked by warmth and an open exchange of views, Dr. Saad Ali Shire and the recently appointed Keating, who is undertaking his first visit to Somaliland, discussed a number of political, humanitarian, security and development matters with an emphasis in particular on how to bolster cooperation between Somaliland and the UN. The Minister raised a matter of immediate concern, the drought which has led to devastating consequences for up to 200,000 families in Somaliland and drastically reduced the livestock population. While accepting there was some assistance from the UN, he noted that it was noticeably limited in scope, and that Somaliland needed further assistance. Michael Keating acknowledged the increasingly worrisome situation facing Somaliland and undertook to assess as a matter of urgency what other measures the UN could take to respond to the crisis both in the immediate term and on a more long-term basis in terms of addressing social, environmental and economic factors. The Minister briefed the delegation on Somaliland’s views regarding the objectives and activities of the UN and looked forward to increased collaboration on matters of technical assistance, while noting it was crucial that the UN align its work in Somaliland with the needs and priorities of Somaliland. The Minister highlighted the constructive role that Somaliland played in the region in terms of security and stability, noted the success of the ongoing voter registration process which was further indication of Somaliland’s democratic credentials, and emphasised the value placed on peace by the people and Government of Somaliland. Dr Shire also encouraged the UN to play a more active role in facilitating dialogue between Somaliland and Somalia, based on the framework agreed on during previous rounds of talks. He reminded SRSG Keating that Somaliland had demonstrated its readiness to talk to its neighbours, but that the international community needed to press Somalia to be a serious and credible counterpart. 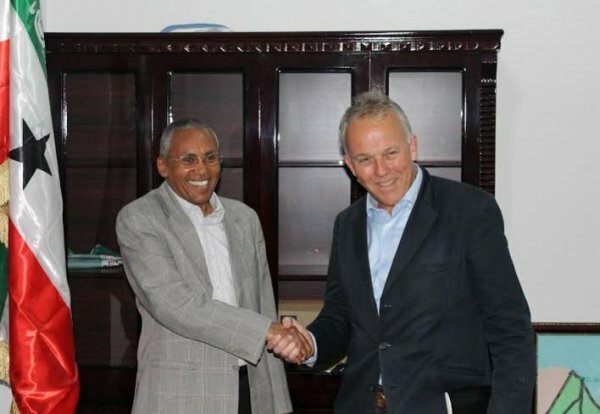 Michael Keating took note of the valid concerns and queries raised by Somaliland, thanked the Minister for his invitation to Hargeisa and the warm reception he had received, and looked forward to building and strengthening relations between Somaliland and the UN.